"Why I Taught My Boys to be Hunters" is the title of an article written in 1937 by Archibald Rutledge that seems as fitting for this moment in time as it did back when Mr. Rutledge wrote it. You see, a transition took place in the fall of 2002 which was a difficult task for me. My father passed away that October just as he was preparing his deer stand for the fall hunt. He never sat in his stand that year, but my brother, Tom, shot a buck on opening morning from that stand. "Such memories are priceless; make some with your kids." My father taught me to hunt just as I have taught my boys to hunt. My sons: Grant, Morgan, Travis and I have experienced countless memories from each and every one of the hunts. From staying in a cold, old farm house on the South Dakota prairie when they were but ten, eleven and twelve years old hunting pheasants to hunting in a snow storm through waist deep snow and howling winds we’ve hunted together. Duck hunting in a North Dakota slough shooting gadwells as they worked their way into the decoys and sitting on a cold deer stand watching for deer on our home farm… we’ve hunted together. When they were even younger yet, they all had their BB guns and were taught to shoot ping pong balls on the ground without aiming - just pull up and shoot with your eyes - like pointing a finger. They became very good at this. Many times they would throw the ping pong balls on our little frog pond then sinking them as they floated across. They learned to shoot as well as my dad. My father’s last hunt was on a hunting preserve just north of Brainerd in mid-September. 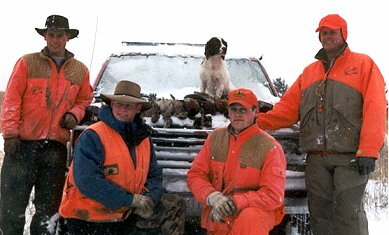 My son, Grant, my brother Tim, Dad and I hunted at Hunt‘s Point in the late afternoon for pheasants. He had not bird hunted for a number of years. Dad, my brothers and I hunted ducks in the leased slough during the 60s and grouse hunted throughout the years. For some reason, I finally scheduled this hunt that fall. The weather was hot and the cover was green but that didn’t matter. Grant and I put four dogs down and made a pass through the field. My dad brought his Winchester Model 12 (bought in 1958 for $75.00) and proceeded to shoot the first three roosters that flew by him. Three shots, three birds… that was my Dad. He was an exceptional shot with a gun - and especially with a rifle. He had purchased a Winchester Model 94 30-30 back in the late 50s and needed to sight it in. No scope, just the iron sights. He took an old 45 rpm record, set it on a post 100 yards away and shot once. The record did not break and my dad couldn’t figure out why he missed. After walking out to the record, he noticed the hole in the center of the record was larger than a normal record. He had only enlarged the hold with his shot. As a young hunter, my father produced memories for me in the woods and sloughs. He was there when I shot my first mallard on our duck slough in 1961 with the Winchester Model 42 .410. He was pushing the old rowboat around some cattails and I was standing in front ready to shoot any duck that flushed. He was there when my first grouse dropped at the shot of the Model 42 in 1962. He brought my brother and I to Wheaton, Minnesota in 1963 for our first pheasant hunt and was there when I shot my first three roosters. 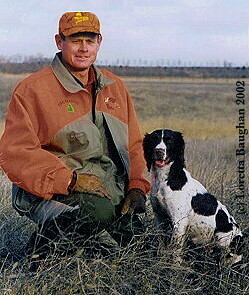 His favorite hunting was for whitetail deer and he was close by when my first deer went down with one shot in 1966. Such memories are priceless; make some with your kids. As Archibald Rutledge said in his 1937 article, "…few relationships are closer than those established by a mutual contact with nature."